Use pre made puff pastry sheets which come with a piece of plastic between each layer. Once you make the rolls, use the plastic to wrap two long rolls separated by plastic to make it easy to take individual rolls out of the freezer at a later date. If freezing, roll and seal the rolls but don’t brush with egg. Once they are defrosted, brush with egg and cut to your desired size. Makes 20 large sausage rolls or 80 mini rolls. Combine all of the ingredients, except the egg and pastry, in a large bowl, mix really well by hand. Lay the pastry out on your work surface. 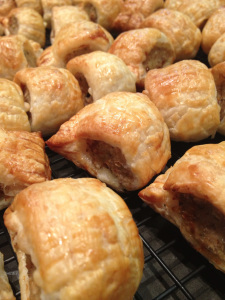 Take handfuls of the sausage meat and form into long sausages to fit the length of the pastry sheets. The sausages should be around 3/4 thick. Place one sausage at the top and one at the bottom of each sheet. Using a large knife, cut across the middle of the sheet to give you two separate sausages. Brush the beaten egg along the cut side, fold over the pastry and use a fork to press and seal the pastry where the egg is. Repeat with all of the rolls. Brush the long rolls with egg. Cut into your desired size and place on a baking sheet, bake for 25-35 minutes depending on size.